BAYSIDE, N.Y. - Dec. 30, 2017 - PRLog -- With the start of the New Year fast approaching, the company behind the "Delightime" brand announced a limited-time only super sale starting on December 29, 2017, to January 1, 2018. 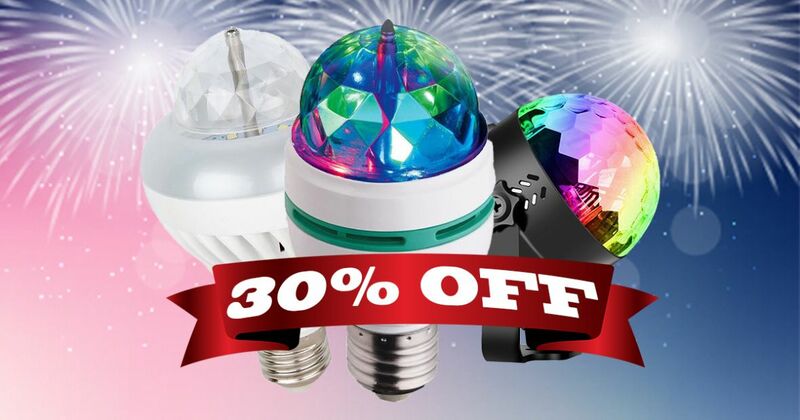 Here, wherein during this period, customers may enjoy a 30% discount on all of the company's fun and exciting party lights which is exclusively available on Amazon.com. G&H Global LLC's marketing manager, Tom Huston, shared during a brief interview, "It has been our tradition to celebrate every holiday with our customers. Like, our way to say thank you for their support." Huston also explained that shoppers may choose from any of their well-loved party lights. He said, "Certainly, there's a light for everybody and for every need." And one, which customers may choose from, is the company's prime disco light: the Delightime Full Color. It's an easy-to-use alternative to big and bulky disco balls, shining in red, blue and green. It automatically rotates, changes color, and is easy to install simply requiring to be screwed into regular light bulb sockets. There's also the Delightime 2-in-1 LED Light, which is multipurpose and cost-efficient. It is designed to appear similar to an ordinary light bulb but has two (2) opposite settings. One of its modes is the "Cool White Light" which provides its user a cool and calming white light. The other mode is the "Disco Mode" that creates a colorful display of dancing lights. Furthermore, the company also offers a strobe light (https://www.amazon.com/Delightime-Color-Disco-Light-Party...) that comes with its own remote control. It's a portable and convenient party light that has a "Sound-Activated" mode, seven (7) beautiful pattern varieties, and a long working life of up to 200,000 hours. All Delightime LED Lights (https://www.amazon.com/Delightime/b/ref=bl_dp_s_web_15353...) are ideal for home parties and gatherings which include birthdays, weddings, get-togethers, and slumber parties. They can also be used as stage lighting, DJ light, and as a child's toy. Additionally, each unit is covered by the company's 100% Hassle-Free Money Back Guarantee where an unsatisfied customer may simply make a return and receive a refund. Amazon shoppers interested to avail of Delightime's New Year 30% discount may simply use the claim code "8P2NAHGE" upon checkout.